One of the biggest porky pies hyped by Toronto's millionaire hucksters is that we're good to go for the Olympics because of all the dandy new Pan Am venues. Or, Myth 5 at NoTO2024. Some sites can be re-used, but even under the relaxed Agenda 2020 guidelines there will be major holes. The ACC and Rexall Centre should be ok, but the velodrome and aquatic centre are too small and too inconveniently located. The Rogers Centre is exactly the wrong size for everything. The athlete's village will have been converted to housing and we need to find somewhere to stick a $1B+ 80,000 seat track and field stadium. The Olympics are much larger than the Pan Am Games and that level of infrastructure just wasn't built. Mayor John Tory seems to have been sold this bill of goods. The mayor added that he’s asked for a report from city staff on the usability of Pan Am venues for a potential Olympic Games. Prepare to be disappointed, Mr Mayor. Chris Selley of the National Post pointed out that "the Pan Am organizers have always been frank: their facilities are not designed for the Olympics." He also says of the 80K+ seat stadium: "Toronto has no earthly need of such a facility." Meanwhile in Ontario, taxpayers just spent $450 million on the four most expensive venues for the Pan Am Games, none of which will be good enough for the Olympics, all of which will have to be replaced by larger facilities if Toronto hopes to host in 2024. There is a long list of new stadiums and every variety of gold-plated facility to be built. Not only are these venues too small -- and will be too old by 2024 -- some are too too far apart.
. . . many of the venues built for Pan Am are so far from Toronto that they may not meet Olympic committee standards. Some events were in Minden Hills (more than two hours from the city), Welland (90 minutes) and Hamilton (one hour). New ginormous 80-100K seat stadium, new athletes' village, new/upgraded/relocated velodrome, ditto aquatics centre. . . the list goes on. 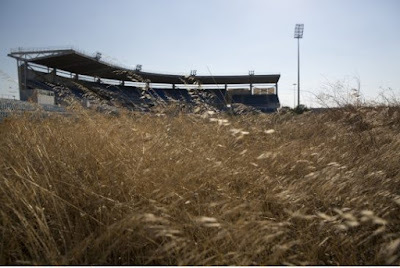 In short, existing Pan Am venues are just not viable for Olympics. They will need to be upgraded, expanded or replaced. In other words, a successful Olympic bid would create white elephants like the totally ridiculous baseball stadium in Greece (pictured above). *Second in an irregular and ongoing series. Owe-lympics Myth 5: Health and Fitness Legacy.